This patishapta pitha recipe is a stunning example of authentic Bangladeshi cooking. 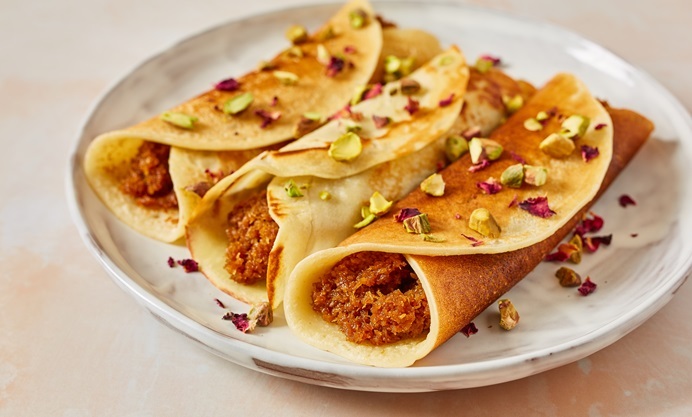 The sweet crêpes are made with rice flour, before being filled with a combination of spiced coconut and date molasses. See Dina's other fantastic Bangladeshi recipes here. Winter in Bangladesh brings forth all manner festivities and the very special art of pitha making - rice-based sweets and savouries. There are over a hundred different types of pitha, but patishapta pitha is one of the favourites across the country. Bangladesh is known for its sweets, and a meal or get-together is incomplete without something to ‘sweeten the mouth'. This dish evokes nostalgic memories of my mother’s kitchen, filled with the sizzling sound of cold batter hitting a hot tawa pan and the aroma of spiced coconut. Made in the style of crêpes, a runny batter is poured and swirled quickly to form paper-thin pastry. The filling for these sweet pitha vary little if kept to traditional recipes, featuring either creamy and milk-based fillings with semolina or rice flour (called kheer) or coconut and molasses ones. My recipe is based on the classic coconut and molasses-filled patishapta my mother made for us while growing up. 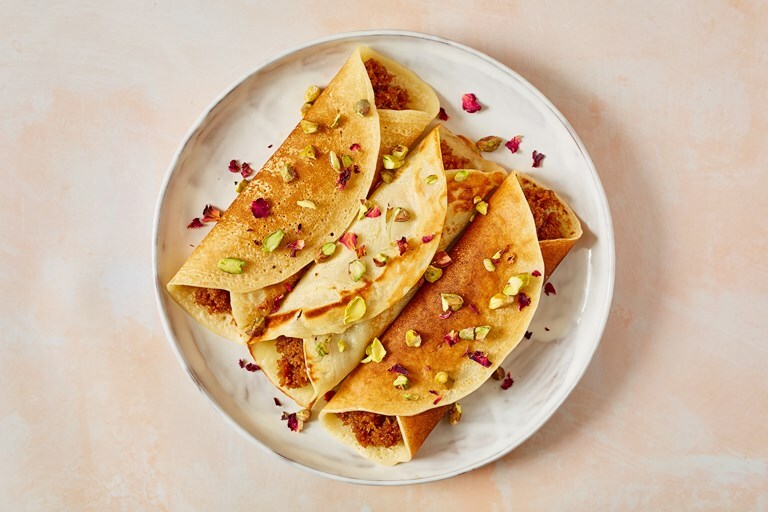 The caramel-flavoured mixture of cardamom, cinnamon and bay-infused coconut and molasses is so delicious encased inside soft crêpes. Pour a little cream on top for the perfect indulgence.